Certain foods can help relieve constipation, a common condition marked by infrequent bowel movements (and sometimes pellet-shaped stools), while other foods can worsen it. Although constipation may require medical treatment in some cases, many people can find relief by eating certain foods and following other smart ways to ease constipation. Following a diet high in fiber-rich foods helps protect against constipation, according to the National Institutes of Health. By consuming 20 to 35 grams of fiber daily, you can help your digestive system form soft, bulky stools that are easy to pass. The American Academy of Family Physicians recommends slowly increasing your intake of high-fiber foods in order to prevent bloating, cramping and gas. People with a sensitivity to gluten should opt for vegetables and fruit, quinoa, beans and lentils, nuts and seeds, and brown rice, and avoid grains such as wheat, barley, and rye. Oats may be acceptable if they are certified gluten-free. When increasing your intake of high-fiber foods, it's important to drink plenty of fluids. Liquids help the body to digest fiber and provide constipation relief by adding bulk to stools. Aim for eight glasses of water per day. There's some evidence that running low on magnesium may increase your constipation risk. For instance, a 2007 study of 3,835 women published in the European Journal of Clinical Nutrition found that those with the lowest magnesium intake were the most likely to experience constipation. Adult males aged 19 to 30 need 400 mg of magnesium daily, while men aged 31 and up require 420 mg. Adult females aged 19 to 30 need 310 mg daily and women aged 31 and up require 320 mg. 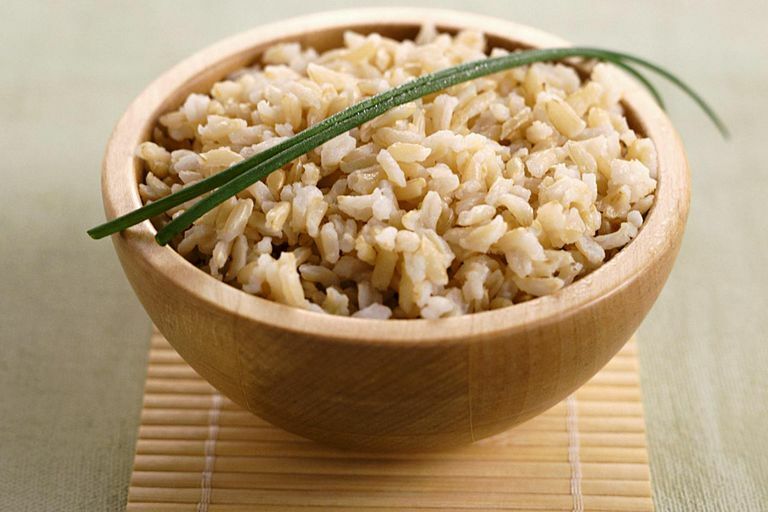 Cutting back on refined, processed grains such as white rice, white bread and white pasta and replacing them with whole grains can boost your fiber intake and protect against constipation. Reducing your intake of fatty foods, including cheese, ice cream, and meats, may also decrease your constipation risk. In addition, it's important to limit your intake of alcohol and caffeine-containing beverages such as coffee, tea, soda and energy drinks. These foods may promote dehydration, which may in turn trigger constipation. To treat constipation effectively, it's important to combine a diet high in fiber-rich foods with certain lifestyle changes such as regular exercise and adequate intake of fluids. In some cases, people may also require further treatment such as herbal or prescription laxatives or biofeedback. If foods and lifestyle changes alone fail to relieve your constipation, talk to your doctor about other treatment options. Self-treating a condition and avoiding or delaying standard care may have serious consequences. American Academy of Family Physicians. "Fiber: How to Increase the Amount in Your Diet". December 2010. Murakami K, Sasaki S, Okubo H, Takahashi Y, Hosoi Y, Itabashi M; Freshmen in Dietetic Courses Study Ii Group. "Association Between Dietary Fiber, Water and Magnesium Intake and Functional Constipation Among Young Japanese Women. " Eur J Clin Nutr. 2007 May;61(5):616-22. Murakami K, Sasakii S, Okubo H, Takahashi Y, Hoso Y, Itabashi M; Freshmen in Dietetic Courses Study Ii Group. "Food Intake and Functional Constipation: a Cross-Sectional Study of 3,835 Japanese Women Aged 18-20 Years. " J Nutr Sci Vitaminol (Tokyo). 2007 Feb;53(1):30-6. The National Digestive Diseases Information Clearinghouse. "Constipation". NIH Publication No. 07–2754. July 2007. Office of Dietary Supplements. "Magnesium."